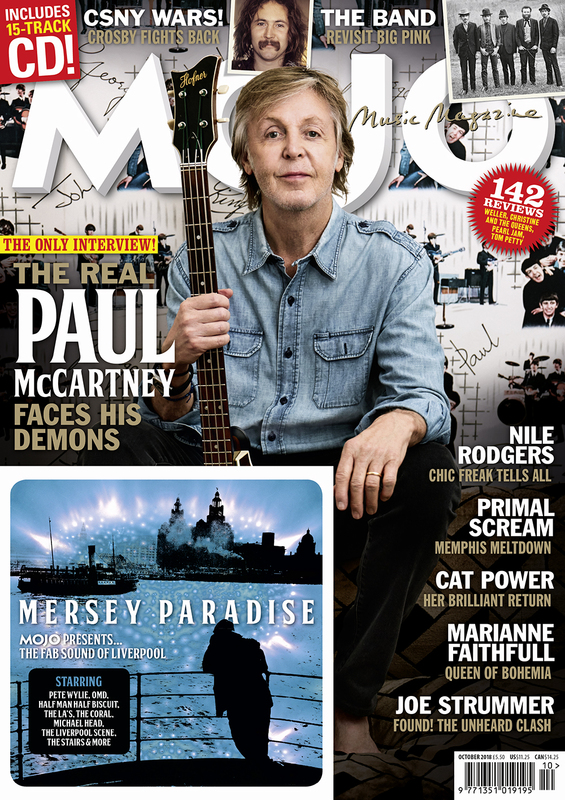 Macca on his demons, kicking weed, dreaming about John, and more, in the new MOJO magazine. PAUL MCCARTNEY OPENS UP about the doubts and fears that fed into songs on his latest album, Egypt Station. Not known as a confessional songsmith, the Beatle talks about his writing as “a therapy session”, citing the Let It Be album’s The Long And Winding Road as a song underestimated for its emotional heft. MOJO 299, in UK shops from August 21. Available online now. And in an intimate portfolio of shots by his daughter Mary, MOJO readers are afforded an unprecedented glimpse off-duty Macca – captured at the ‘Magic Piano’ on which he wrote Fixing A Hole, posing in front of Beatles wallpaper and in the middle of a yoga move. If you dig the Beatles, and/or you’re interested in Paul McCartney (“one of the greatest melodists who ever lived,” as Harold Goodall claims elsewhere in the feature) it’s a must-read. Also in the latest MOJO: Nile Rodgers counts his blessings; celebrating The Band’s Music From Big Pink; inside Marianne Faithfull’s extraordinary new album; Primal Scream seek redemption in Memphis; David Crosby stirs it up. Plus: Joe Strummer; Cat Power; Graham Parker; Pearl Jam; Fatoumata Diawarra; Billy Gibbons; Dinosaur Jr; unheard Tom Petty and more. Moreover: our covermount CD is a Macca-inspired collection of Liverpudlian pop and rock, including classic tracks by Deaf School, The Coral, OMD, The La’s and The Liverpool Scene. HAVE A COPY SENT STRAIGHT TO YOUR HOME!